Held Over for a 2nd Week: The Death of Stalin, and The Leisure Seeker! Ottawa Premiere: The Devil & Father Amorth (special bonus – a 24 minute companion piece screens after the feature)! 50th Anniversary Restoration: The Great Silence! 20th Anniversary screening of The Big Lebowski – a Collective Arts Brewing / The SmoQue Shack movie night! The Absent Friends shadow cast hosts The Rocky Horror Picture Show! 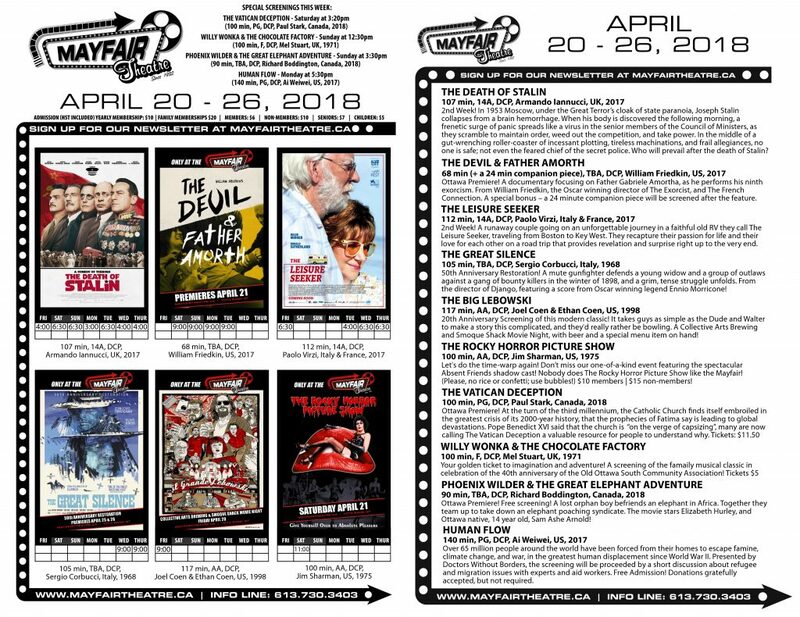 Plus, special presentations of The Vatican Deception, Willy Wonka & The Chocolate Factory, Phoenix Wilder & The Great Elephant Adventure, and Human Flow!